It took Universal 15 years after Disneyworld opened to figure out it should open a theme park in Orlando. Finally opening in June of 1990, under the name 'Universal Studios Florida', it consisted of... Universal Studios Florida. Yes, it was a theme park, but only that. A day park. 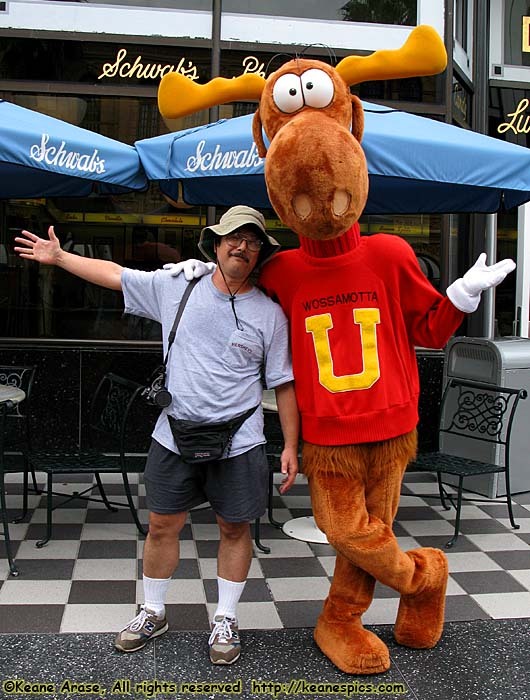 So in the mid-90's, around the time Universal Studios was acquired by Seagram (the liquor company), ground was broken on a billion dollar venture to make Universal a multi-day experience. It was to be the first real threat to Disney's virtual monopoly on Theme Parks in the central Florida area. 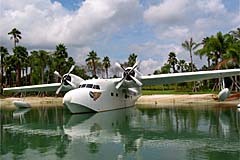 In May 1999, now under the ownership of Vivendi and called Universal Studios Escape, a second theme park named Islands of Adventure took Disney's concept of a theme park, and matched it, something I'm not sure was done before. 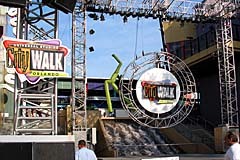 In addition to the theme park, was the addition of City Walk, a nightclub and merchandising area, and two Hotels run by the Loews Hotel chain (not Lowes, which is a hardware store), a high-end luxury hotel chain. Another hotel was added a year later. 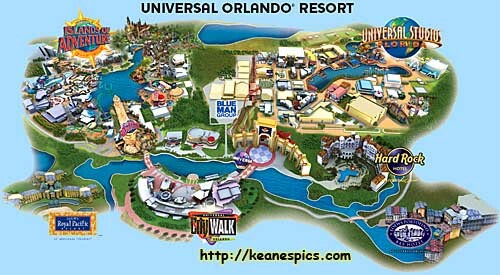 Overhead map of Universal Orlando. 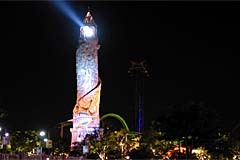 The entire complex was renamed in 2001 to Universal Orlando Resort. Universal's property is a fraction of the size of the Mouse's house, but they do make good use of the space. 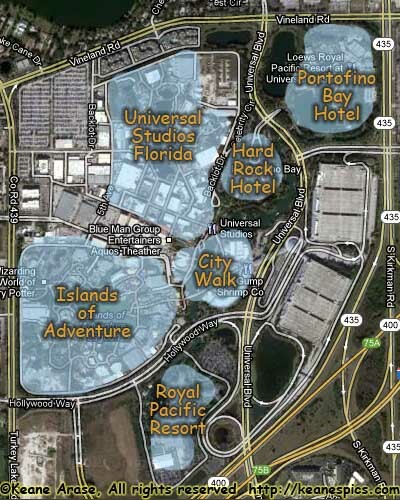 Universal actually has some unused land, but announced in mid-2012 that they would be opening a fourth hotel, rather than the expansion of Islands of Adventure into that area. Universal Orlando is Disney's main competitor in Orlando, and with good reason. They study everything that Disney does. If Disney comes up with a novel (good and well received) idea, chances are that Universal will adopt those ideas within a short amount of time. I have been surveyed many times by Universal Orlando on the web and a couple times in the parks, and they always seem to have a question or two or more about Disney, and your behavior with them. Disney has Mickey Mouse, Universal has Beetlejuice. Disney has Donald Duck, Universal has Shrek. Disney has Chip and Dale, Universal has Jake and Elwood Blues. Do I need to go on here? Now that doesn't mean that I don't like Universal. Quite the opposite in fact. Universal caters to the crowds by presenting less-than-Disney-sanitized attractions, ones that include not so subtle innuendos and just plain raunchy humor. Go see a Beetlejuice show if you want to know what I mean. 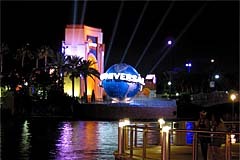 Universal Studios Florida opened in 1990, and was the original theme park here, and in some places you can tell. Still, they've updated the park to try to keep the tourists interested, but it's biggest boost was the addition of another theme park, right next door. The On-site Hotels are all operated by Loews Hotels (not Lowes), and are all up-scale hotels, from the Royal Pacific Resort on the less expensive end, to the Hard Rock Hotel, and final the amazingly expensive Portofino Bay Hotel.